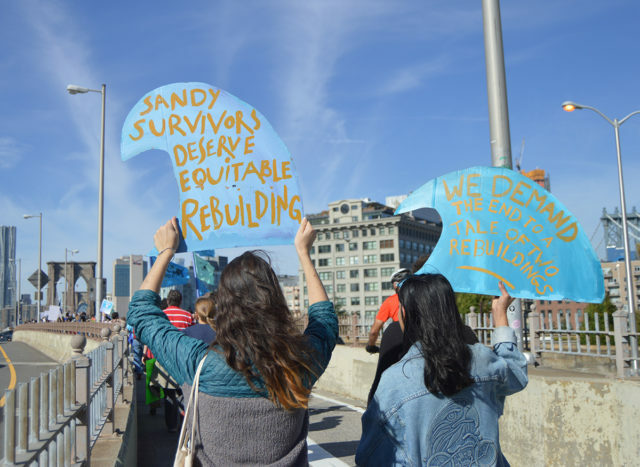 On a cool October 28th morning, WE ACT members trekked across the Brooklyn Bridge with 5,000 other New Yorkers to commemorate Hurricane Sandy. 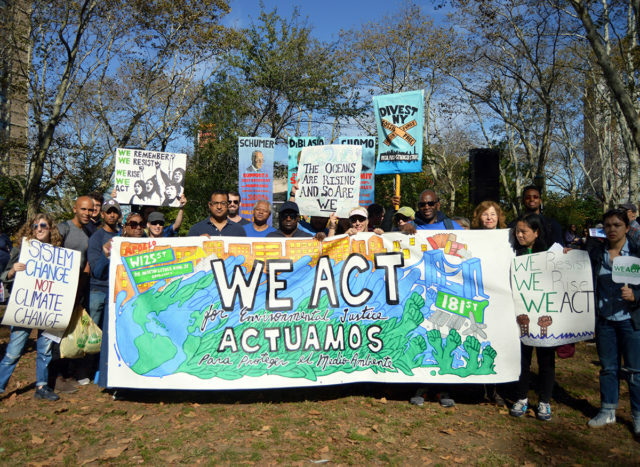 “SYSTEM CHANGE NOT CLIMATE CHANGE,” was displayed on one of the signs held by WE ACT members. The weather was exceedingly polite for the fall season, contrasting eerily with the painful memory of Hurricane Sandy that we marched to commemorate five years later. As we made our way into lower Manhattan, I took in the gentle warmth of the sun and the dappled churning of the nearby East River flowing beneath us while thinking about the personal stories I heard earlier that morning at the Sandy5 March rally. We heard from a mother from Queens desperate to protect her daughter after their ceiling collapsed on her home during the storm; a young woman, dedicated to fighting for climate justice, was piecing herself together after the storm destroyed her home and family life; and activists in Puerto Rico declaring the resiliency of proud island people in the face of the federal government’s neglect and untold human suffering. Gazing at the opposing coastlines of Manhattan and Brooklyn, we were faced with an imminent set of questions: What will happen when the next storm comes? Which communities will be hit the hardest and who has the most to lose? How will those who are still bouncing back fare? At what point will our demands for accountability from the corporations, institutions, and individuals responsible for the current crises be heeded by our elected officials and world leaders? WE ACT marchers begin their journey over the Brooklyn Bridge for the Sandy5 March on October 28th, 2017. On October 28th, thousands of New Yorkers made it clear that five years after the Superstorm Sandy, the promises made by our elected officials are still unfulfilled. As rampant inequality continues to define New York City’s social landscape, climate change threatens to aggravate and increase these deeply rooted disparities. Across the city, plans to build protection along the coastlines of highly vulnerable Hurricane Evacuation Zones are either underwhelming or still in development. Yet, compounding our frustration is the fact that low income and black and brown communities — already contending with lack of access to social services and environmental discrimination — can expect to deal with what trends confirm are more frequent and devastating extreme weather events. Beyond the scope of my view to the south, the waters of the East River curved eastward to cradle Red Hook and mingle with the Gowanus Canal. Five years ago when the floodwaters swept through these streets, some residents of Red Hook and Gowanus public housing were trapped in their apartments without water or power for weeks, and contaminated canal waters flooded homes and businesses. Today, a four feet high wall runs along Beard Street. According to the Director of Hazard Mitigation for the NYC Emergency Management Department, the wall, which is temporary, is not meant to provide full protection from a storm as powerful as Sandy. This is one of a number of painful examples of how some of the most vulnerable members of our society are knowingly left at risk to impending threats. WE ACT at the Sandy5 March start point in Brooklyn. I marched with WE ACT at the Sandy5 anniversary because the organization adds a crucial component to the movement for social and environmental justice. Questions of racial and economic inequality are deeply entangled with questions about the environment. In addition to asking critical questions about our dependence on fossil fuels and the increasing risk posed by climate change to people the world over, we must also push ourselves to think deeper. We must advocate also against racial and economic inequality and be sensitive to the unique ways that climate change disproportionately impacts us at the local level. When I think ahead to the many climate and social justice battles we may face in 2018 under President Trump, I believe that local climate activism matters more now than ever before for communities of color. When we come together like we did on Sandy5, we have power to make our local challenges national news. And most importantly, when we engage with civic organizations like WE ACT, we have the power to make climate change an issue our local and federal governments pay attention to and do something about. Nasib McIntosh is a member of WE ACT originally from south Florida. He holds a BA in Africana Studies from New College of Florida where he pursued an interdisciplinary understanding of the black experience around the world.